JH: Which of your works you consider to be the most important to you and why? CMA: In the period of the 70s and 80s there are some tapes I suppose, that were important to me at any rate, and that were shown around a little bit. The first of them-one of my earliest tapes, was called The Viewer’s Receptive Capacity (1978), which was made in collaboration with a woman called Gabrielle Bown, whom I’ve now lost touch with. We made about three or four tapes together and they were all produced in a television studio- as all my earliest works were. Parallel to that collaborative work, I was also making my own stuff. Horizontal & Vertical (1978) was one of four landscape pieces that I made. Then jumping a bit, there’s a tape called The Room with a View, which was made in 1982. Then An Imaginary Landscape made in 1986 and The Stream, which was made between 1985 and 1988. There were lots of different versions of The Stream including several two screen versions, but there was also a single screen version that was completed in 1988. It was at that point that I stopped making single screen tapes because I felt there were limitations on the way I was interested in going. I felt that I needed to move outside of the screen in some sense. I wanted to explore the relationship between the screen and the space and to do that I started working with installations. But prior to that point I did make quite a few videotapes. It was between 1977 and 1978 that I started to seriously work with video tape. I had dabbled before that, but those works don’t count and anyway they are all lost. At that time I was living in Montreal. In 1972 I was working in an inner city high school as an AV technician- a kind of dog’s body. They had an IVC One-Inch Recorder to play back programmes to the kids and I had access to a Portapak at the Montreal School Board’s “Instructional Materials Centre” that I used to work at during the summer period when the school was closed. There was a also small TV studio and I got a little experience working with that equipment during the period before I left. In 1974 I got a new job as a photographer in an AV department of a college and they had separate departments for video, audio and photography. I was the photographer but there was also a video guy – an American draft dodger called Peter Graham. He ran a little video department and they had portable video for the students to use. It was at that time that I did my first video editing, in the winter of 1974. I edited something with a stopwatch using the pause control and hitting the record button manually. The college had a fine art department and a cinema department and they had connections with a Montreal gallery called Vehicle Art. I did a documentary piece about a conceptual artist who taught at the college and it was shown in the gallery. So those were my earliest projects, but they don’t count because they weren’t really ‘art’ per se. It wasn’t until I came to England in the summer of 1975, although I didn’t come to London until 1976. JH: So where were you then? CMA: When I came to England I went to live with my parents for the first six months. They were in Leigh-on-Sea, near Southend, and I went to Southend School of Art for six months. They had a clapped out video recorder, but nobody knew where the camera was. I dug the recorder out of the basement and dusted it off and tried to make it work- but I couldn’t. I missed the (Serpentine) summer show because I wasn’t aware anything like that was happening. It wasn’t until the ‘Arena ‘ Video Art broadcast on BBC 2 in 1976 that I realised there was stuff going on. Then when I went to film school at the LCP, I came into contact with people who were interested in video art. But in terms of my work with videotape, the first tape I really count is something called Continuum (1977) which was a double screen piece that exists a a single screen documentation and that I still have and still occasionally show. JH: So when you say ‘tapes’ what do you mean by tapes? Do you mean single screen or do you mean that’s it’s purely for a screen based work rather than an installation? CMA: Good question. I did some double screen things, as I have already said Continuum was double screen and I did another piece called The Docklands Tapes, (made with Chris Hartwill) which was also double screen. But they were both student projects done while I was at the LCP, early in the second year – so about1976/77. My work was, by and large, single screen because it was very difficult to show double screen thingsanywhere so if I had a double screen I would make it into a single screen thing. There were very few installations. I made one installation in 1980, which was a three-channel work (Field Study, 1980) and then I made another one in 1982 (Light, Time Memory…. ), which used closed-circuit video plus a slide projector when was at Goldsmiths. Everything else was single screen tape and that was because of distribution problems, and because of screening issues. JH: Did you find that early on when you first started making work that issues of distribution were a problem? CMA: Yes, it was a problem right from the start. First of all screening was a problem. For example The Viewers Receptive Capacity was a half hour piece that was selected for the New Contemporaries in 1979. I went along to the exhibition at the ICA in London and there it was running on a television screen on a plinth in the middle of the upstairs gallery space- in the Nash Room. The work was surrounded by all sorts of other stuff- there was a sculpture over there and there was a photograph over here and of course people were just walking past my videotape. I made a big fuss and demanded that the videotape works (there were one or two video pieces by other artists) were given a special screening. The organisers agreed to set up a screening in the cinema downstairs, and they just made it like a cinema presentation with TV monitors. It was around that time that I realised that there was a problem with the work that I was making, because they didn’t really function in a gallery, but equally they didn’t work in a cinema either. So I was troubled by this, and it was a problem that plagued me across the 80s, from when I started making tapes at the end of the 70s right across the 80s, and it eventually led me to abandon making single screen tapes. But distribution was, by and large, an LVA issue. I was quite involved with LVA for a while right at the beginning (1979-80) and then again for a couple of years at the end of the 80s. So, in the middle period I didn’t have anything to do with the organisation but at the two ends of the 1980’s I did. But to answer your question, it was an issue right from the start. It was a question of: How do we show this stuff and what do we do with it? JH: So in the early works that you’ve just listed, which you are calling tapes? CMA: They are all video tapes, yes. JH: What were some of the aesthetic considerations and what were you interested in? What were you searching for at that point do you think? CMA: I realise that it’s quite complicated when reflecting on it. I was at film school and we were introduced to a lot of film theory and none of it seemed particularly pertinent to video. That was the thing I used to get frustrated about because I can be quite aggressive and angry and I used to get up and shout, ‘This isn’t relevant to my practice’ and ‘I can’t really relate to this. This is all about film and about narrative; I’m not interested in those things!’ At the LCP film school, there were a number of artists there including Tony Sinden, and later on Ken McMullen and Peter Donebauer, and those people were important to me. 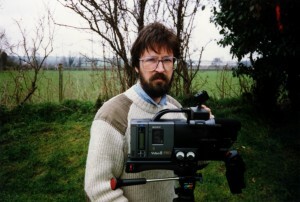 Tony Sinden ran experimental film screening classes on some evenings. They were sort of an optional extra. You would go at the end of the day and it was around that time, once I started seeing work by artists, that I realised that this work was much more relevant to me. The artists’ films were more relevant to me than the stuff I was getting in the classes that were about film theory and all of that. But I was also being shown lots of things. I was seeing quite radical documentaries like ‘Nightcleaners’ by theBerwick Street Film Collective, and some of the early Frederick Wiseman and Nick Broomfield films . There was quite radical filmmaking mixed in with conventional Hollywood type narratives, mixed in with interesting British Cinema such as Powel/Pressburger, as well as early British documentaries by the GPO film unit and early Lindsay Anderson “free cinema”- a real jumble of things. Then because it was at the time when the structural/materialist filmmakers were also theoretician/artists like Peter Gidal and Malcolm Le Grice. Their work was influential as were the ideas that they were developing around cinema, the rejection of narrativity and an interest in the material concerns of film, I was quite conscious of trying to apply some of those ideas to video. I felt I was the only person at the LCP doing that. I have to say that there’s something about my personality that I deliberately set myself up in opposition to things. So I found a way to be an outsider, to continue to be an outsider because I was at a film school that really wanted to turn out film directors and camera operators. We were having classes on how to direct and how to light. I had to do lighting and camera exercises and so on, but meanwhile I really wanted to work with video and increasingly I wanted to be an artist rather than a filmmaker or a television producer or whatever else they thought we might become. I was always trying to somehow bring my video practice in and make that the centre of what I was doing in film school. I have to say that people like Ken McMullen picked up on that and helped with it. He supported what I was doing- he was interested in it and took me along to the Slade so I met up with people like Stuart Brisley and Iain Robertson. I ended up being Ken’s cameraman on a couple of his projects because I had the technical skills initially to do that and so I found myself in demand as a sort of lighting cameraman on a few low budget film productions. But I wanted to make videos and I believed that video had its own language and I wanted to discover what that was. I hadn’t yet seen many of the really important early video works, but through Tony Sinden I was introduced to David Hall and I went along to something in 1977 at Maidstone School of Art. I showed a piece of work and David was there and he told me about London Video Arts. I also made some connections with Stuart Marshall who lived next door to David in Brixton. I remember going over to David’s house and talking to Marceline Mori who was living with David at the time and I remember meeting Stuart. Even though I was a student I began to try to mix with the practicing artists who were interested in looking at what video could do. I was very conscious that there were issues that were relevant to video, that were distinct from film but that drew on some of the same concerns, especially the materialist practice. JH: Did you go to the Co-op as well? CMA: Yes, I used to go to the London film maker’s Co-op and some of the filmmakers from the Co-op were important to me- particularly Chris Welsby because of my interest in landscape and because I was trying to make videos that had something in common with what Welsby was doing with cinema. JH: Why were you interested in video and not film? Since you were in between and you didn’t have any particular allegiance to either in a way from the very beginning, why choose video? CMA: I loved it for aesthetic reasons. I loved the low resolution and the texture of the image. I just loved the quality of it. I loved the fact that it was instant and instantly re-viewable. I didn’t like film because I didn’t like to wait- I was very impatient. Also because, as a teenager I had been fascinated with tape recorders and with sound recording. I used to play with tape recorders all the time, and for me video was the perfect fusion of the tape recorder and the film camera. I just fell in love with it as a medium and I loved all of the things that many other people saw as drawbacks. For example, in the early days you couldn’t edit video very easily. For years editing was terribly clumsy, and I was content to experiment with duration. I was happy with the black-and-white, grainy low-resolution image and I used it. I explored it, -played with it. So it was this thing about the tape but also about the ‘liveness’ of it. It’s like what we are doing now (recording the interview with a video camera). We can look at the picture and know it’s the going to be the same thing and I love that. I love the fact that I can see it on a television screen at the moment of recording and that if I wanted to change the exposure or mess around with the colour, if I turn the dial on a chroma control it cranks up the colour, or I could adjust the contrast and I was able to see it happening live and in ‘real time’. 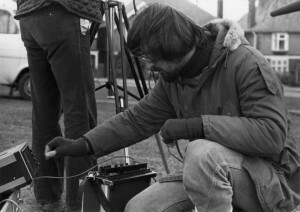 Also I liked fact that the sound-picture relationship was simultaneous. With film you had to have a separate machine, it had to be synchronised and it was a mess to worry about all that synchronising and all of the editing afterwards with the film here and the tape there and moving it round. Video was all one thing. I loved that. JH: What about the issue of the frame since you are talking about the technology? At the time obviously the structural materialist was a movement I suppose. The artists that were playing with those ideas were showing us the frames, showing us the differences between the still and the moving. What is it about video, in the sense that you can’t see the frame? Is that something that you are interested in as well? CMA: Yes, all the stuff about it being a signal. I remember feeling that I was stuck somewhere between Peter Donebauer on the one hand and David Hall on the other because I thought David was too rigid in his definitions of what video could be and Peter seemed to me to be too spiritual. I wanted something that was in between and so I really believed in the signal as the essence of video, (Although this is what Peter believes too. I’ve done interviews with him for my book and I know we were absolutely in agreement about that.) I saw video as a signal, not as a set of frames. I saw it as a continuous flow of signal like a sound recording. The Vasulkas, whom I didn’t know until much later, understood this relationship between sound and picture or the sound signal and the picture signal: that they were part of the same technology. But the frame was not relevant to me in the sense that I saw video was a continuous signal laid down on tape. JH: Did you know the Vasulkas’ work at that time or was it much later on that you come across their work? JH: Can you talk a little bit about post 1989 and the shift from tapes? What happened at that point because it was a very specific shift wasn’t it? CMA: Yes absolutely. It happened partly as a result of the experience I’d had across the 80s with showing work. What happened would be that work would go out, LVA would distribute it, and every so often I’d get a little note back from Jeremy Welsh or from Dave Critchley saying, ‘Your tape was shown in Spain’ or ‘Your tape was shown in Sao Paolo’ or somewhere else, and I’d think ‘Oh that’s nice’ and it would go down on my CV and I’d think, ‘Wow’, but it didn’t really mean much to me because I wasn’t there to see it screened. I had no sense of what the response was like. I had no sense of how it felt to see that work in another context. It just didn’t exist for me. So that was one problem I had. The other problem was this business of duration. I was making things that you had to sit down and watch but they weren’t television and they weren’t cinema. I think the other thing that was happening as a result of finally making my last tape, The Stream. It was a double screen piece with two monitors where there was a back and forth between the two screens. I couldn’t show it like that in any screening context, so I made this combined split screen version of it and realised that I was really interested in something that was happening ‘off’ screen. I realised that there were interesting things happening the minute you put a monitor on a plinth in a space. 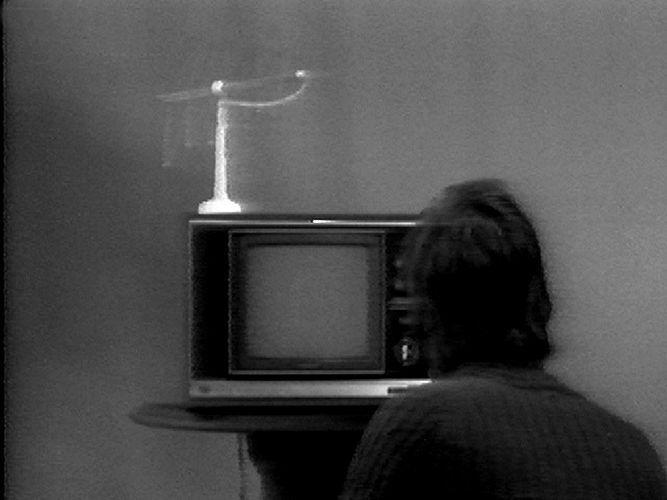 There was a relationship between the monitor as object and the space it was in. Whether you walked around it, whether you sat in front of it and watched it, there was an off-screen dimension and I thought this was important to me. It’s important to say that I was at Goldsmiths after LCP between 1981 and 1983 on the MA course. I was the only video artist on the course. I was the “only video artist in the village”- literally. I used to have disagreements with Jon Thompson, the artist who ran the course. Not Jon Thomson the digital artist- the older Jon Thompson, and he disliked my work and was really very blatant about it. Fortunately Nick De Ville was there and he was a more positive. But they made me very aware- and the course made me very aware of conceptualism, because at that time Goldsmiths was, I think quite neo-conceptualist and it was beginning to emerge as a very important course. I think it was the second or third intake. JH: What year was that then? CMA: 1981 to 1983. The year before, I think there’d been a couple of “art stars” come through, but basically the big names didn’t come through that course until the year after me. My year was rather a non-event in terms of artists who went on to become well-known but there was a very rigorous conceptual base to the work. They were really, really getting us to look at all the issues behind what we were doing and they were introducing us to very interesting artists and ideas and challenging everything that we said or did. It made me really think hard about what I was doing and what I was trying to achieve. It made me address the whole business of ‘off-screen’ and so I suppose by the time I made the The Stream (which I finished the last version of in 1987/88) I realised that I wanted to do things that meant I really did need to address what was happening in the (gallery) space. So I started to make installations and the first piece I made was called An Imaginary Fountain. It was made for Canada House in London. There was a Canada House show that was curated by Denise Hawrysio and it was supposed to be ex-pat Canadians. (I wasn’t really an ex-pat but I got included as one.) I made 3 channel, nine-monitor piece. I remember I was teaching at Maidstone (Kent) at the time and so I managed to borrow nine monitors from the college and lug them there. (I built a structure and I had nine monitors. It was three-sided and it was basically about the fact that this was only a fountain because everybody made the conceptual relationship between it and the space between the images. The gaps between the thing made the meaning and so that was where I went. 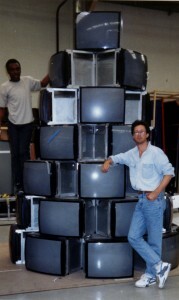 The following year, in 1990 I was commissioned by the Harris museum to make a larger piece and so I made a 4 channel 35-screen version of it, which was called Eau d’Artifice. JH: That’s the image with security guard in it? Tests for "Eau d'Artifice", Samulesons, London 1990. CMA: The image with the security guard in it is a restaging of the installation at the South Bank in London. Eau d’Artifice was originally done for the Harris in 1990 on 34 Sony “Pro-feel” monitors – as they were called; 19′ Pro-Feel monitors. They were stacked in 7 layers and then when I re-did it at the South Bank, at the Royal Festival Hall, I used the larger Pro-Feels- the 29′. They were big monsters. They weighed a ton and so the whole installation was much bigger though it was still composed of 34 screens. It was really about making a structure where the structure is relative or in relation to the screens. What is on the screen is only part of the meaning. The structure and the space between the screens are crucial to the work in some way. I wanted the spectator to be aware of the fact that they were participating in the process of meaning. That was really important to me at the time. JH: What about sound? What were the key issues with the sound? Can you talk about that process? CMA: I think for me the sound followed the picture. The fact that you had a microphone on the camera meant that you recorded the sound and there it was so I didn’t really get very deeply involved with the sound with the installation works. With the tape works a lot of the meaning in the early tape works is about what happens on the soundtrack. So there is a lot of things being said on the soundtrack in the tapes. In the TV studio tapes, the ones made with Gabrielle Bown, it’s about the dialogue between the two of us and she stood in for the person in the institution and I stood as the ‘outsider’. We did a lot of things where she was on the screen and I was in the space and we were arguing or we were having what I thought was a dialogue and then suddenly realised it wasn’t. So there were a lot of things about language, about television as an institution, about the thing as a process. That was only one way, giving the illusion that there was some kind of an exchange. So it was stuff going on like that in the early tapes. In the later tapes I started to use the sound track. When I was at the Goldsmiths the two externals were the painter Rita Donna and Bill Pye the sculptor, and he said to me: (partly because I think I’d used music by Philip Glass in something I showed for assessment) ‘You really should make your own soundtracks’- so I followed his advice. So by the mid 80s, the soundtracks on my tapes were much more constructed. They are much more collaged. There are layers of sound. I even had a go with making ‘music’ so there were levels at which I was trying to do something that approximated music. Since I’d fallen in love with the work of the minimalist composers, particularly Steve Reich, I was very struck by trying to use repetitive sound, layers of sound, phasing, those kinds of things. I did a bit of that. JH: And what about the editing process? Can you talk a little bit about how that technological shift affected that part of it? CMA: Editing is very important to me. Right from the beginning, in the early days when you had use a stopwatch and hit the record button. Then after that, around 1974, from that period when I started making tapes again through to when I got my hands on U-matic editing, it was real-time stuff. But then once U-matic editing came along, I completely fell in love with the idea of being able to perform my edits electronically and to mess around with the contrast, brightness and colour and all those things. So editing for me was not just about cutting, it was about mixing. Peter Donebauer built something called The Videokalos Image Processor, which I made a tape with before he did. He built the prototype and then designed and built the production version and there was one at the LCP. So I started using it and in 1978 I made a series of tapes using the Videokalos where I was mixing images. The only way to mix them at that point was to re-scan. The Videokalos would only genlock one source, so I was mixing three or four tape sources by recording stuff on portapaks, playing it on TV screens and pointing video cameras at them, feeding those into the Videokalos and mixing them live. I was messing around with the colour, the contrast and brightness to play with the levels so I could distinguish between the different channels and so that the viewer could distinguish between them when they watched it, to make them aware that there was a movement through a series of tapes or a series of sources- a series of channels. All of that was happening, so for me editing was about the electronic mixing and manipulation of the video signal very early on, 1978/79, around that period. Once I left film school in 1979, even before I did the MA, which was 1981, I was already actively involved with LVA. I formed a partnership with two LVA members – Alex Meigh and Pete Livingston, and we set up a production company. 3/4 Inch Video it was called at first. We bought, through my contacts, a second-hand U-matic edit suite from a guy I knew who was a video technician at LCP and set it up in one of the other rooms at LVA in an office just off Wardour Street, on the corner of Tisbury Court. There’s an Anne Summers shop there now- but it wasn’t Anne Summers when we moved in. Above it were offices owned by a company called “The Other Cinema”. LVA had the front office and 3/4 Inch Video had a two rooms upstairs- and we set up our editing equipment there. It was to be our “studio”. Pete never did anything much with it but Alex and I used it to make new projects. The idea was that we would hire it out to other artists to cover our costs. For example both Tina Keane and Stuart Marshall used the edit suite to make some work. But that was my edit suite if you like. JH: Did LVA not have facilities? CMA: Not at that time. JH: So did they just do distribution at that point? CMA: They just did distribution at that point yes. When I first joined LVA it was literally the tape collection and playback. There were no edit suites. There weren’t even any cameras at first. In fact, when I first joined LVA, they were originally in Little Newport Street near where the photographers’ gallery was. Then they moved to Tisbury Court, which is where we set up 3/4 Inch Video. The only access to video editing outside of the art schools was the Fantasy Factory. Sue (Hall) and Hoppy (John Hopkins) You had to do everything by the rules that they set, and I got the impression that some people didn’t like working there. Alex had worked there- She was editing manager for them for a while and then I was interviewed for the job when she left. I ran out of the interview virtually screaming because they showed me this flow chart that was like a map unfolding. How to answer the telephone was one I remember, and it was ‘If this, then this, then that’. There was this incredibly complex chart of procedures and rules to follow and I just thought, ‘No, I can’t work like this’. So we thought we could set up this alternative edit suite, with the idea would be that it would be ours as well and I made work on it. When they came to interview me for Goldsmiths that’s where they came to see me. When David Curtis came to interview people as to whether they were going to be included on “Video Artists on Tour ” programme in 1980, that’s where he came to see me. Tisbury Court- my edit suite there in Soho. JH: Did you get funding? How did that work? CMA: No, I went to the bank and got a loan. JH: So you got it with your own money? CMA: That’s right. Peter Livingston had some money. He was in a terrible accident and he had received some kind of compensation- so he had some dosh. Alex had some money; she was from a fairly wealthy family. I went to the bank manager in Leigh-on-Sea and I said, ‘Lend me £2000, I want to start up a video company. ‘Video- What’s that? Yes, OK, we’ll lend it to you’. So they lent me 2 grand, because I’d just graduated from LCP with a degree in filmmaking. So we put in 2 grand each, and with 6 the grand we bought the edit suite, all the bits, two monitors and sound amplifiers, speakers, etc. We built a structure for it and everything. We got together 6 grand and we set up a little company with it. JH: Did it work out? CMA: No. What happened was that Alex and I fell in love. Pete Livingston was very excluded. We wanted to turn it into a production company- we wanted to do other stuff and we were quite energetic. Gradually we drifted apart and got into a dispute about how we should operate. Pete froze the assets of the business. Alex’s father found this flashy lawyer and Pete settled out of court. We bought Pete out and Alex and I changed the name of the company to ‘3/4 Inch Productions’ and moved from Tisbury Court to Brixton. I was living in Peter Donebauer’s basement on the Brixton Road and after I left the LCP I had kept in touch with Peter and we became friends, so I was renting the basement of his house (it was a big council house) at 291 Brixton Road. It’s still there, a big beautiful Victorian house. I lived there at the time so we took the whole edit suite and set it up in the basement and we ran it from there for a period. Then we decided that it didn’t work commercially to have it there, so we rented a very nice studio in SE1 on Lavington Street just near where Tate Modern is now. We ran it from there for a a few months but it was too hot and there was too much light. It had a huge glass window along one side- like a greenhouse. I tried to put up seamless paper to keep it cool. It was a big, beautiful space and we had the edit suite there, but it didn’t work out. Then we just moved around. We moved it to Kensington. Alex’s mother was a psychotherapist-quite a well-known one. She owned a penthouse flat on Queen’s Gate Terrace. We lived there for a while, when Alex and I first started living together. We brought the edit suite there and that was when I first joined the MA at Goldsmiths. Peter Donebauer was setting up Diverse Productions around that time and when they were interviewing potential film and video editors they used our edit suites to do their interviews. By then we’d updated the edit suite. Jane Thorburn’s company- AfterImage were going up to a new Sony Series V, so we bought their 2860 edit suite, (which had a better controller- an RM 440) than our old one) and their u-matic portapak (VO 4800) from them. JH: Why did you choose to do that? Was it just that you needed a change? CMA: I wasn’t making tapes anymore. I’d moved into the installation mindset and I’d stopped making tapes. I wasn’t using the suite-we weren’t using the kit. Alex had no interest in video. She had retrained. I was more and more interested in making installations. That really meant that we didn’t need a lot of kit. We’d had a break-in in Brixton, and our portapak and camera were stolen. Following on from that I sold the edit suite and the controller. I sold off a digital time-base corrector I had. We sold all of that stuff- we just got rid of it all because it was a room full of kit and I was increasingly interested, not in having all of the stuff, but in thinking more flexibly and so on. JH: But basically you made a living from the business or did you teach as well? CMA: I made a living from a combination of things. We were running the business as a production company, and I did freelance including quite a lot of little films for the BBC and we also did corporate, educational stuff, little promos and things like that. I did a lot of industrial photography as well so I was doing that and I was also working for a time as a freelance video editor for a company called “Utopia”, which was a music business, but they had some video kit. I was also teaching part time and making my work as an artist. So I was wearing lots of different hats and I saw them as complimentary. I saw them as feeding off each other and I had very clear ideas about the difference between what I called my ‘applied work’, (the commercial or at least non-fine art work), the fine art work and my teaching. I saw them as feeding off each other in different ways. I was learning about the technology through my corporate practice and commercial practice. I was trying to keep up with all of that. I was freelance editing so I was doing things for music promos and things like that. What I was doing was fairly crude but I was doing it, and I learnt how to do three-machine editing and those sorts of things. But I was teaching in art schools and I was teaching in a film school. JH: Where were you teaching? CMA: Well I was teaching in a variety of places. I was teaching in art schools so I was doing part time in Preston even then. But I was also teaching at the London International Film School, which was really extraordinary because they had very wealthy clients, so for example, I taught John Huston’s son to edit video. The students paid very high fees and I would teach them how to edit and shoot on the most clapped out equipment I’d ever seen. The video element was something the students had to do as part of the course. They had to do this kind of introduction to video. For years I used to do that part time. So there was a mix of things and I found it increasingly difficult to do all of that and work in Preston. (Preston Polytechnic at the time.) They offered me a permanent half time contract in 1986, so I took it and dropped a lot of the freelance things and started concentrating on teaching, being an artist, and working in an art department and so on. But I guess for about 4 or 5 years I split my time between lots of different things. Some of which were commercial, including the BBC stuff. It’s very hard to separate these things out. Theory and practice were so interwoven, when I started discovering some of the theory I realised that I’d already previously assimilated it because of the practices that had influenced me. I was rediscovering things- a bit like realising that Peter Campus’ Transition 1 was one of the most crucial influences on my practice because of its attitude to video space. I’ve only realised it as a result of writing my book, which has taken me two or three years. When I was writing about ‘Transition 1’, I was talking to Peter (Campus) via e-mail and I realised that I’d understood something profound about video very early on, not because I was smart, but because I got it through the work of one of the leading pioneers who’d understood it ‘on his skin’. So when I saw the Vasulkas’s work I understood it intuitively in that way. Those ideas had come to me through some of the other theoreticians I’ve been interested in such as Merleau-Ponty and ideas I’d had about embodied knowledge and all of those things. So my relationship to video and its tactility and so on, were tied into an interest in the embodied brain and ideas that I developed out of my readings of David Bohm and so on. These things will come up in the theory section but you don’t really separate that. You don’t learn about theory and start applying it to video. This is what I used to shout at my tutors at the LCP about. I said, ‘This is no good. It’s the wrong way around. I’m not going to illustrate your theories by making films that somehow take these ideas. The filmmaking comes first and the theory evolves out of the practice.’ It was one of the things that I used to really get upset about. JH: How have changing technologies have impacted on your work? You started practicing earlier on in the seventies, and there have been massive changes in the last thirty years. and that affected the way I worked in the sense that we used the duration of the spool. It was a half hour segment and I got used to thinking in that way. The fact that the sound and the picture were married meant that you couldn’t separate them out and you couldn’t mess around with them because they weren’t on the same place on the tape. So when you tried to edit, you had this problem of where the sound was in relation to the picture as well. Initially there was that problem but I didn’t see it as a problem, I just thought, ‘Well that’s what it is’, no more than I thought ‘Oh, what a drag. I don’t have five legs- I have two legs’. So video was that and as it changed the changes just simply gave me a new colour on the palette. It gave me a new aspect. It was as if I had a tool kit that initially only had a screw driver and a hammer in it, and then someone gave me a drill and then I found that I could use a saw. What you could do with video gradually improved and increased. So for example when I got my hands on the Videokalos, it made it possible for me to mix pictures, it made it possible for me to change the colour, it made it possible for me to introduce colour. Those things were just incorporated in and affected the way I thought about video and affected what I could do with it. I just incorporated each new possibility as it came along. I knew there were things in the industry that I didn’t get my hands on till much later because I would always talk about this idea of accessible technology. I knew quite early on of broadcasting in colour, because when I lived in Canada they were broadcasting from the USA in colour. We had colour television in 1966 or 1967. But when I was a child living in Montreal the NBC colour broadcasts would begin with the peacock. I only saw it in black-and-white, we were still watching Disneyland or whatever it was called and you saw the NBC peacock logo in tones of monochrome, but I was aware there was a colour picture there. So yes, there was accessible video technology as opposed to what was out there in industry and as the things became accessible, I incorporated them into what I did. They made it possible to do things that hitherto I’d not been able to do. JH: What things? Are you talking about processing or are you talking about where you could exhibit the work? CMA: Good point. Initially it was about processing. But I guess it was also about distribution because U-matic and then after U-matic, VHS meant cassettes and meant distributable forms. I don’t think the display side of it changed very much. Projection was not a real option until quite late on in my practice. Obviously it affected the installation days, but if we talk about the display, I guess the videocassette meant distribution was possible and it meant there was the possibility of the work going out in a way that at the beginning it wasn’t. I guess my first answer was based on the fact that, for me, video was about something that I could manipulate. I got very excited by the fact that I could mess around with the colour, that I could mix images, that I could do things with the signal. I just loved all of that.